← Asters – another great weed. Records Revisited Post 1 of ?? Back in June I posted about the importance of Records in beekeeping. I have to say, this is the most challenging aspect of beekeeping for me. Keeping up with the records always seems to get put off, then not done at all. There have been times when I have arrived at a hive site ready to add supers only to find them already on, AND NOTHING ABOUT IT IN MY RECORDS. This normally means it was done on a day when I had a million other things to do and probably was talking to the hive site host when I should have been recording my hive notes. It is important that I make improvements here. I am at the point where I can’t remember everything in my head any more. Just recently while pouring over what records I do have, I realized I had one more hive than I had thought all summer. I was wondering where those deeps and frames went! I had been looking around for them, not remembering if I had loaned them out to someone or just stashed them at one of the hive sites for later use. In any event good records will just help you keep track of bees and equipment alike. Recently I have gone to the dark side. After having the same cell phone for the last 8 or 9 years I acquired my first smart phone. I have gone from a simple communication device that didn’t even have a camera to one that probably is conscious of itself. I don’t know what other people use these amazing bundles of technology for, but I immediately began to think of BEE uses. I found some software for keeping track of hives, but I would have to pay prior to using it. I am pretty picky and I don’t like paying for anything sight unseen. I saw a hive tracking website on The Bee Vlog, but just as Bill pointed out, I don’t have data service at all of my hive sites so it was not a valid solution for me. Thanks Bill. The goal was to find something that would allow me to take records on the phone and then sync them later. My way of keeping notes on hives rarely has anything to do with brood pattern or finding the queen. I don’t look at those kinds of things when I am checking bees. I focus more on activity at the entrance, smells, and what the bees seem to be packing in AND out. I have found by focusing on outside observation and comparison between hives I can adequately assess the health and well-being my colonies. It is my belief that taking that brood chamber apart is very disruptive and not worth the information gained if it is done on a regular basis. If I do open a hive during the summer it is only to remove the inner and outer covers to assess the completion of the top honey super. If it is NOT full I put the lid back on, if it is full I add more supers. In either instance it is important again to keep those records. I began looking for some type of note taking software and was amazed to find something that suits my needs relatively well. 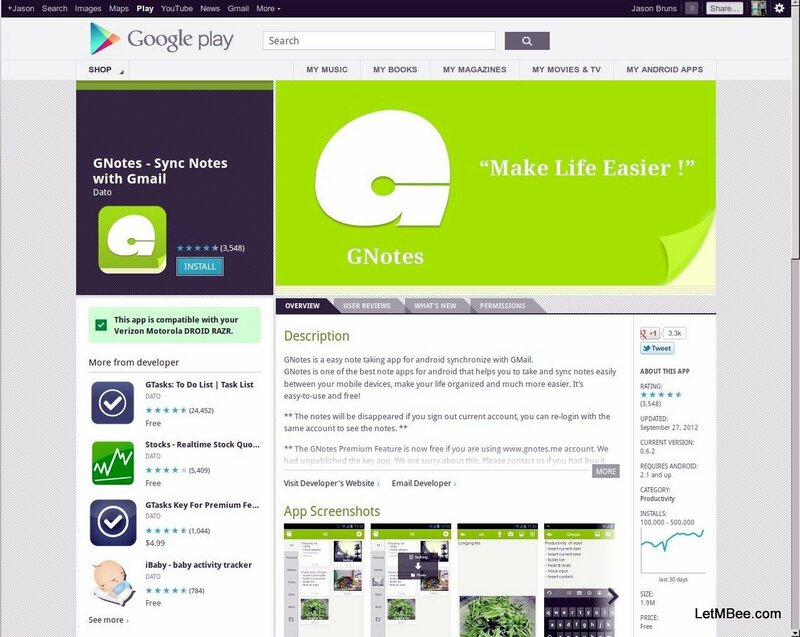 The name of this little application is GNotes. From their site “GNotes lets you take notes, capture photos, create to-do lists, shopping lists, record voice memos, create handwriting, paint and so on, and you can search the note easily.” Not all of these features are really that useful for what I am doing with the bees, but there are several that have greatly simplified my beekeeping life. I am using an Android phone, but I believe there is a version for the iphone (I could be wrong, the application looks different). You need to have or set up a G-Mail account to utilize the sync feature. Over the next several posts I will be discussing the features of this software and how I am applying it to the bee operation. Before you download and start porting all of your hive data over make sure I have completed the series. There are shortcomings and I will write about them in the last post. This entry was posted in Hive Reports, HowTo, Posts and tagged bee, beekeeping, Indiana Beekeeping, records. Bookmark the permalink. 6 Responses to Records Revisited Post 1 of ?? Yeah, it’s too bad HiveTracks isn’t a little more mobile. I also looked at Beetight, but to use the mobile app (which I assume allows for offline records and data sync) you need a pro account, which is $15/year. I’ve been a smart phone hold-out. Mainly because I didn’t want a 2-year contract and I wasn’t a fan of any of the plans from the major carriers. Then I discovered Ting wireless. And I admit that the bee related uses were part of what pushed me over the edge. I’m not completely married to using HiveTracks. I’m looking forward to your series. Maybe some combination of HiveTracks and other tools will work well for me. Keep checking in. I am almost done with Friday’s edition. I keep notes in an odd fashion, but this tool really helps me keep track of things. It doesn’t cost anything and I am not getting any money from Google. 🙂 It really seems to be helping me, and if I have trouble keeping notes I am sure others do too. I went from a “smart”phone to an old fashioned phone…but i print the hive tracks sheets and take them into the bee yard with me and enter them to the werbsite when I have time! There is no “One Way” so that is acceptible. Just as long as you are taking notes and trying to replicate the things that work, and do a way with the things that don’t. The internet provides a great resource for sharing results of methods that work. How do you like hive tracks? I like it better than what I was doing which was trying to make notes of everything I was seeing. For me this is much simpler and for me simpler is better! Simple is best. I agree. 🙂 I hate the writing part.